Green is the new black; how to create a botanical inspired home. I’m having a bit of love affair with plants at the moment and it seems I’m not the only one. No longer is the luxury of having a garden such a make or break deal when deciding on a place to live; many of us are creating our very own botanical haven indoors. In this blog post I’m exploring three themes of botanical decor and suggesting ways to introduce, style and most importantly care for your house plants. I’m also discussing various ways to incorporate botanical decor through paint, wallpaper, interiors and scents. Now, reader, I up until very recently have continually committed plant murder, either by drowning or starvation, so I too am new to becoming green-fingered. May I suggest a few fantastic sources that have really helped my plant knowledge, the first being ‘House of Plants’ by Caro Langton and Rose Ray , Wonder Plants by Irene Schampaert (both available in our store) and also my good friend Abigail, who is one of those amazing Mother Earth creatures that grows all her own fruit and veg and makes her own face creams. She even has a ‘family rhubarb’ that’s currently in its third generation of life but that’s a whole other blog that you can read here. Try experimenting with vintage-inspired floral wall paper or wall murals in dusky pinks, taupe and ercu. I personally like that beautiful decay look where wall papers have been layered upon each other and gently torn back to reveal a glimpse of a pretty flower or pattern; it creates a wonderful sense of nostalgia. Go wild with plants and blooms ! Arrange them at different heights, in mismatched ceramic and glass pots in muted tones, hung from the celing, displayed on window ledges, shelves and floors. Let greenery be your main focus of colour. Use Annie Sloan chalk paint in warm pastels to restore old tired furniture into expensive-looking French inspired pieces, perfectly imperfect with rustic edges and signs of age. Working with wooden floors add an antique Persian or Turkish rug for warmth and source one-of-a-kind vintage botanical prints to hang on walls. The composition of fusing two solid colours like a cool white paired with a vivid, fresh green will make a space feel light and airy. Use pale stained woods for shelving and furniture to display uniformed mini succulents planted in concrete or terracotta pots. Introduce botanical body care products housed in traditional brown ointment bottles to continue a uniformed theme. Make a feature point from a large floor plant or hang one large trailing plant from the ceiling in the corner of a room. Keep walls minimum with just one statement art print, perhaps something in a geometric, graphical design. If you are looking to incorporate texture try a white and grey vein marble or tiling with square subway tiles, preferably with contrasting black grout. A nod to seventies decor with tonal green shades like sage, olive and forest expressed in beautiful tropical prints. Adorn walls with bold, statement palm tree papers or maybe just one wall if the space is on the smaller side. Introduce lots of natural textures such as canvas, cork and rattan and display wall hangings crafted from warm white wools and linens. Keep floors bare and varnish with deep, chocolatey stains using a large floor rug made from seagrass or sisal to sit underneath large pieces of furniture so it blends into the room, as opposed to becoming a dominant feature. Inject a little bit of seventies style glamour with metallic hints in antique gold and matte finish copper seen in picture frames, handles, knobs and ornaments; an original vintage pineapple would be ideal ! If the space allows, use a variety large palm plants potted in jewel-toned ceramic pots displayed on the floor to create a true paradise setting. I started off with super low matainence house plants, the ones that pretty much take care of themselves. The ‘Aloe’ plant is the perfect starter plant, it likes the sun (so position ideally near a window) and a small-medium version only needs around 1/2 teacup of water once a week, allowing the soil to dry out completely in between. It’s seriously better to underwater than overwater ! Another good way of keeping healthy plants is to think about where you plan to position them in your home. Whilst most plants prefer bright light, be mindful to protect them from intense direct sun, just like you would with your skin in blazing summer heat. As a simple rule to follow, consider this; South­‐facing windows - bright light, East/West­‐facing windows - moderate light, North­‐facing windows - low light, this should prevent you from scorching plant leaves ! Also consider if there is a large obstruction outside of your window, it will affect the light your plant receives. Invest in a water spray bottle ! Plants that prefer humid conditions such as ferns, ivies or tropical plants will benefit from mist sprays in-between waterings. Drought-­tolerant plants like succulents and cacti do not need added humidity as their native habitat is the desert providing dry, intense heat. I’ve added ‘watering days’ to my phone calendar so I get a reminder to water or spray my plants. I also keep an eye on my iPhone weather app, if we’re predicted some sunshine I’ll move my plants closer to light catching areas in my home. Of course there is much more detailed house plant reading and research out there but hopefully these 3 suggestions will be a helpful starting point. Creating a botanical haven, doesn't neccessirly have to involve nurturing a collection of green living things, it can be still be achieved through colour. Pantone, has named 'Greenery' the colour of the year for 2017, detailing 'Greenery is nature’s neutral. The more submerged people are in modern life, the greater their innate craving to immerse themselves in the physical beauty and inherent unity of the natural world.' And luckily in 2017, green walls are no longer just fixated to bathrooms and kitchens. There's a whole host of gorgeous shades of green glory suitable for any room in the home, from vibrant bursts of zesty lime, more classic shades like deep, rich emeralds and forest greens to the contemporary, design-led green grey that is gracing the walls of uber luxe retailers like Aesop and Workshop coffee. For those wanting to make a bolder botanical statement in the home introducing a tropical wallpaper is a great suggestion. 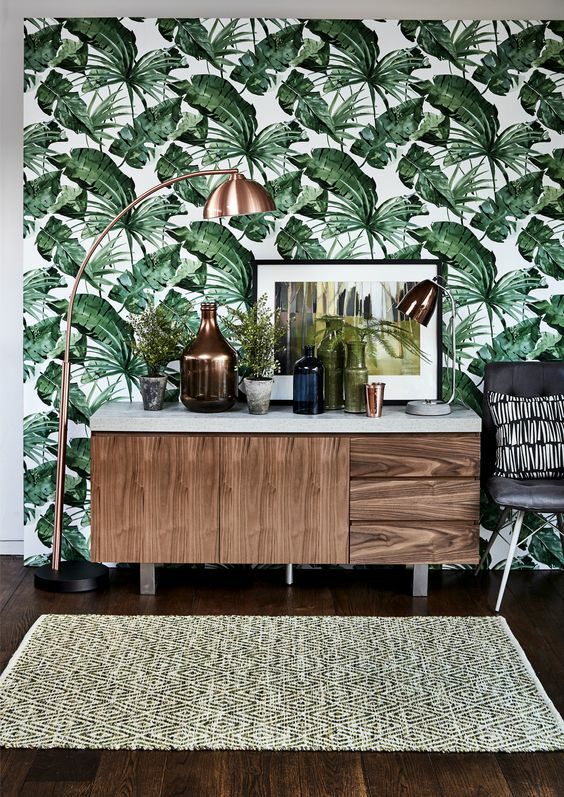 Let the walls do the talking with retro inspired palm tree papers inspired by motels in Palm Springs, vibrant jungle prints that quite literally look like living walls or opt for something softer such as sage and olive inspired safari prints. If you are concerned that you may tire of the botanical trend quickly, make small changes to your home that can easily be introduced or removed. One of the easiest ways to do this is to use plant inspired textiles such as bedding or cushions or maybe reupholstering a chair or headboard with a nature themed print. Now, here's a suggestion for those of you who are brilliant at killing plants and flowers; don't throw them away just yet ! Remove them from their water and let them completely dry out, next either hang your dried bouquets from shelving units or attach to bed frames for rustic chic inspired interior. Another good use for dried petals or leaves is to press them using a herbarium (sold here) and display in antique brass glass frames. Invest in a variety botanical prints like illustrations, water colours or photographs of beautiful rural landscapes and adorn you wall walls, shelves and mantels. Also try adding quirky, nature themed accessories such as vintage pineapples, bee cabinet knobs and leaf jewellery trays. And last but certainly not least, a botanical inspired space would not be complete without at least one growing green ! Pot your plants in lots of different ceramics vessels and glass vases working with a selection of textures, colours and styles. Finally, adding an invigorating fresh fragrance like mint, eucalyptus and citrus or a rich, relaxing scent like cedar, sandalwood or pine will add to the essence of a botanical haven. Plant based skincare brands like Honest and Aesop not only smell and feel incredible but their simple, uniformed packaging is really easy to introduce into any room. Lighting a scented candle like Skandivisk's SKOG, that smells like 'pine and fir blended with aged leather and woodland lily of the valley' creates a wonderful sense of calm and relaxation, that lasts up to 50 hours ! It helps that it is packaged in a beautiful forest green glass jar complete with an oak wooden top too !